The Breeders’ Cup is not only about winners. The losers also went into their races carrying the dreams of their owners and trainers. But for one reason or another their dreams remained just dreams, as much as they believed they were destined to come true. That is the nature of the sport. Here are several of the Classic dreams that failed to become reality, but are worth telling nonetheless. On a mid-September morning, Eoin Harty, had just finished schooling a horse in the paddock and happened to be walking past the statue of Zenyatta on his way back to the barn when he received the news that the great mare’s sire, Street Cry, had died. “I thought, ‘How apropos that I should be passing Zenyatta’s statue at this very moment,’”Harty said. Not only was Street Cry Harty’s first big horse after going out on his own, he was pointing Street Cry’s son Footbridge for the Breeders’ Cup Classic. Harty had to feel that scene at the statue and the timing of the news were too coincidental not to hold a special meaning. But in the end, it turned out to be nothing more than a coincidence. At least, however, it gave him hope for a while that his longshot had fate on his side. In a similar type of story, Bill Mott had to take special pride in training Cigar Street up to the Classic, a race Mott won in 1996 with the legendary Cigar, who died Oct. 7 at Rood and Riddle Equine Hospital following surgery on his neck. Now, nearly 20 years later, here was Mott training Cigar’s “nephew,” whose dam is a half-sister to the Horse of the Year and Hall of Famer. Mott’s son Riley, a student at the University of Kentucky and at Santa Anita to help out his dad, knows how special Cigar Street is to his father. Another person who was hoping the stars would align for Cigar Street was co-owner Jake Ballis, especially after he and his partner Rashad Lewis secured the services of John Velazquez for the colt. It was Velazquez’ agent, Angel Cordero, who picked Cigar Street out at the sale. “Angel does bloodstock work only for us,” Ballis said. “He rode Groovy for my father (John) back in the ‘80s. Ever since we bought this colt our dream has been to win a grade I with him with Johnny aboard. But as the Mott family, Jake and John Ballis, and Eoin Harty are well aware, dreams often don’t come true in racing, as much as you want to believe they will. And when they do come true for one person they shatter the hopes of another person, who believed just as strongly that the dream was meant to come true for them. In 2000, a young Venezuelan-born trainer, Carlos Morales, watched his colt, Yankee Victor, storm home to win the Met Mile. It was like watching his life flash before his eyes. His wife, Gabriella, was only a day or two away from giving birth to their first child. Nine days earlier, Morales’ father, Luis, died in Caracas at age 74. For Morales, it was one life ending and one life about to begin. It was difficult for Morales to talk about it with breaking into tears. It has been nearly 15 years since Morales’ victory in the Met Mile. He now lives in Ocala and has raised a family, and although he still works with horses, his main preoccupation is with soccer and baseball and his family. In his last year of training, he saddled a top-class sprinter named True Direction, owned by Moreton Binn, to victories in the Fall Hghweight Handicap and Hirsch Jacobs Stakes, while placing in three other stakes. After True Direction retired, Joe Appelbaum, a supporter of the New York breeding program, bought into the stallion. Appelbaum admitted they did a poor job managing True Direction, standing him one season in Florida and two in New York. He now stands at Los Aguacates in Venezuela. Morales and Appelbaum eventually formed Off the Hook, a breeding, training, and development facility, with Morales based on the farm in Ocala and Appelbaum, based in New York. The impetus of Off The Hook, was Morales buying a Siphon filly for $60,000 at the 2003 Keeneland yearling sale, although they did not have much interest in pinhooking at the time. But Morales and Nick De Meric convinced Appelbaum to sell her at the Keeneland April 2-year-old sale the following year and she brought $500,000. That started Off the Hook. Several years later, Appelbaum’s friend Tom Coleman, who he had known since they were kids, was looking to buy a broodmare. His daughter had asked him to get her a dog, but Coleman decided it would be better if she had a foal to play with outside instead of a dog. So Morales and Appelbaum found him a Quiet American mare named American Skipper at the Keeneland November sale. Although a bit straight in front, she looked like a good broodmare prospect, especially coming from the same family as Dubai World Cup winner Well Armed. Unfortunately, the foal she was carrying died a few days after birth, so there was no baby for Coleman’s daughter to play with. With no stallion in mind, they all thought, why not breed her to True Direction, who was standing in New York at the time. This way, they could have a New York-bred to eventually go through the program, have a foal for Coleman’s daughter, and then eventually send the foal to Morales in Florida. American Skipper gave birth to a colt, and Coleman originally boarded her at a large private estate in Bedford, N.Y. so that he and his daughter could visit the mare and baby. He eventually moved American Skipper to Keane Stud, for a more professional birthing experience. After the colt was weaned, he was sent to Morales. The first month at the farm, he jumped a fence, but his hind legs didn’t make it over and he got caught on top of the fence and was stuck there for several minutes before he was able to get his hind legs over the fence. He fell to the ground and remained there motionless, and Morales thought he had knocked himself out. But he apparently was just tired from the ordeal and eventually got right up on his feet. He grew into a tall leggy horse and just kept growing and growing. When he was sent to trainer Chad Brown in the late fall of 2011, he was found to have an entrapped epiglottis, which was corrected by surgery. When Appelbaum saw Brown a few months later in late February or early March at Palm Meadows, he asked him how the colt was doing and he replied. “We’re going to win the Albany with this horse.” Although the horse finished second to Willy Beamon six months later, that was a pretty prescient of Brown to almost nail his prediction. After the Albany, Brown sent the colt back to the farm with a lower leg injury that laid him off for almost a year before he returned at Saratoga in 2013. After a pair of thirds, he went on a roll for Coleman, winning six of seven races in state-bred company, with his only defeat by a head. Morales was convinced that the colt, who was running mostly at mile, could stay a mile and a quarter and mentioned it to Brown. It was then that Brown jumped him way up in class and put him in the Suburban Handicap and the whole world knew who Zivo was. He won the Suburban by three lengths and then finished second in the Jockey Club Gold Cup, earning a trip to the Breeders’ Cup Classic. Unfortunately, this was another dream that no one ever got to hear, as Zivo, racing in 14th for the first mile, was just too far back to make any impact on the race. He passed five horses in the stretch to finish eighth. But there are better days ahead for Zivo, who still is a great story even without a Classic victory to help tell it. Oh, by the way, Coleman’s daughter did get her dog anyway. Dreams come in all shapes and sizes and at any stage of our lives. Lost in the Eclipse Award battle between California Chrome and Shared Belief was the fact that trainers Art Sherman and Jerry Hollendorfer have been friendly rivals for years in Northern California, and at the ages of 77 and 68, respectively, they have been thrust into the spotlight with brilliant 3-year-olds. Each has a tremendous amount of respect for the other and their star 3-year-olds. Sherman still finds it hard to believe what he’s been able to experience at his age after so many years as a trainer and a jockey. The fairy tale ending didn’t happen for either Sherman or Hollendorfer, but that doesn’t mean this whole year hasn’t been one fairy tale for both of them. And we’re all aware by now that the fairy tale will continue next year, and who knows where each horse will be in his career when we get to the bluegrass and a date in Kentucky. Perhaps Horse of the Year will be on the line again. You can’t help but think that. After all, isn’t that what dreams are made of? Can you imagine a jockey getting banned for excessive use of the whip in a race he won by 16 lengths? Well, that’s what happened to jockey Adam Kirby after his victory aboard Toast of New York in a novice race at Wolverhampton in England last November. How and why does a rider get a whip ban winning by the length of the stretch? Because Toast of New York needed to get a high rating in that race to be allowed to run in the U.A.E. Derby the following March. By winning by such a huge margin, it did get Toast of New York into the U.A.E. Derby, which he won with Jamie Spencer aboard. So, 31,000 miles and three transatlantic flights to America later, including two from England to California, Toast of New York made his dirt debut in the Breeders’ Cup Classic, falling a nose short of completing one of the great fairy tale stories of recent years. Each day, Willie Delgado could feel the magic of California Chrome returning and was convinced the spell the colt cast over the country in April and May was about to be felt once again. He could feel it in the most important place of all – his arms, as Chrome dragged him around the track each morning. “He just wants to pick it up and go,” he said. 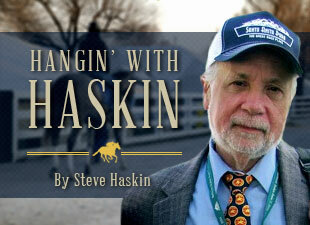 “He’s a lot more alive now than he was before the Pennsylvania Derby. He’s got muscles on him now and he’s just focused. At Philly, he was looking all around. He’ll do that on the first day, but he kept doing it. The following day while schooling in the paddock, California Chrome showed just how on the muscle he was when he suddenly pawed at the ground and went straight up in the air, nearly flipping over and coming precariously close to the wall of the saddling stall. Of course, as we all know by now, California Chrome ran his heart out, performing much better than the vast majority of experts thought. A victory would have ensured him Horse of the Year. It must be asked then, should a neck defeat, in which he raced 44 feet farther than the winner, now remove him from consideration? Don’t be surprised if many voters, after letting the impact of the Classic settle in, take his body of work and his gutsy performance off only one hard-luck race in five months under consideration in their thinking and wind up putting his name down on the ballot. There are several horses in the running for top honors, and Chrome most assuredly should be one of them. The Zayat family was so devastated over the injury to American Pharoah several days before the Breeders’ Cup, they canceled their trip to Santa Anita, even though they had Mr. Z in the Juvenile and Prayer For Relief in the Classic. But with Ahmed Zayat’s youngest son ill, they decided not to push it and watched it as a family at home. The one silver lining in a way was seeing Texas Red, who American Pharoah crushed in the Frontrunner Stakes, demolish his field in the Juvenile with an Arazi-like move that just inhaled the entire field in a matter of seconds. What does that say about American Pharoah? How in the world did he beat this colt so easily if he wasn’t a special racehorse? The bottom line is that American Pharoah’s reputation soared without him even running. The Zayats also should remember that the Breeders’ Cup Juvenile has produced one Kentucky Derby winner in 30 years. Of course, you never know in racing how a race is going to play out and who is going to run the race of his or her life. That wasn’t to be, as Prayer For Relief was never a factor in the Classic, but it does show how good a horse can be doing leading up to a race, but just doesn’t have the talent to beat class horses at the top level. Ironically, while Mr. Z, who was beaten a nose for fourth, was 19-1 and Prayer For Relief was 54-1, Mr. Z’s trainer, Wayne Lukas, did win the Juvenile Fillies with Take Charge Brandi, who was 61-1. The filly’s 79-year-old trainer and 74-year-old owner Willis Horton had been at Santa Anita the year before suffering the agonizing nose defeat of Will Take Charge in the Classic. For them, one dream died and one unexpectedly came true the following year. Nope, you never know in racing, where dreams are made and, in most cases, shattered.